A male nurse jailed for life two years ago for killing two hospital patients with lethal drug overdoses murdered at least 90 patients in total German police said today. 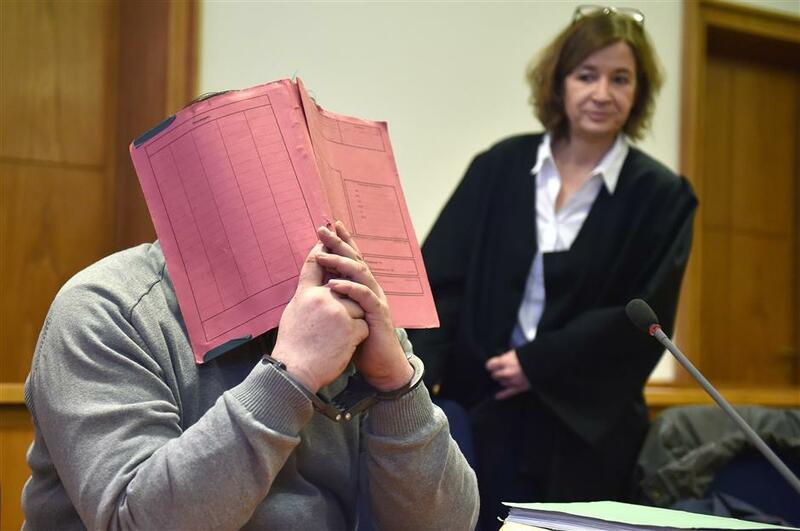 German former male nurse Niels Hoegel hides his face behind a folder as he waits next to his lawyer Ulrike Baumann (R) for the opening of a session of his trial on February 26, 2015 at court in Oldenburg, northwestern Germany. A male nurse jailed for life two years ago for killing two hospital patients with lethal drug overdoses murdered at least 90 patients in total, and possibly twice as many, German police said yesterday, calling it the country’s worst killing spree since World War II. Niels Hoegel, 40, was jailed in February 2015 for two murders and four counts of attempted murder or causing bodily harm on intensive-care patients at the Delmenhorst hospital near the northern city of Bremen. Police said today that forensics experts had since exhumed and analyzed more than 130 additional bodies and had found evidence of a vastly higher death toll at two hospitals where Hoegel had worked between 1999 and 2005. “The insights we were able to gain are terrifying, they surpass what we could have imagined,” said Johann Kuehme, police chief in the city of Oldenburg, where the other hospital is located. The death toll “is unique in the history of the German republic,” said the chief police investigator in the case Arne Schmidt, adding that Hoegel killed “without a discernible pattern” and preyed especially on those in critical condition. There was “evidence for at least 90 murders, and at least as many (suspected) cases again that can no longer be proven,” he told a press conference. Hoegel has admitted to injecting patients with drugs that can cause heart failure or circulatory collapse so he could then try to revive them and, when successful, shine as a savior before his medical peers. He earlier testified that at times he acted out of “boredom,” that he felt euphoric when he managed to bring a patient back to life, and devastated when he failed. After the revelations, police and prosecutors three years ago launched a special forensic commission dubbed “Kardio” (Cardio) to look into other patient deaths. Presenting their findings, police said today that 134 bodies had been exhumed and tested for traces of the deadly drugs, and that police also reviewed scores of medical records and questioned hundreds of witnesses. The cause of death in many cases could not be determined because the bodily remains had been cremated, said Kuehme. The grisly revelations date back to June 2005, when a female nurse witnessed Hoegel trying to inject a patient at the Delmenhorst hospital. The authorities exhumed several patients’ bodies and detected traces of the drug in five of them, declaring it either the definitive or possible contributing cause. Several senior medical staff members at Delmenhorst also face separate trials for having failed to act speedily over the high number of suspicious deaths.